Homebrewers from Georgia and Illinois were the big winners in Samuel Adams annual LongShot American Homebrew Contest – which this year focused only for beers that would be entered in Category 23 of a sanctioned homebrew competition. Georgia resident Richard Roper (right) with Friar Hop Ale and Rodney Kibzey (left) of Illinois with Blackened Hops beer. Earlier this year Kibzey won Meadmaker of the Year in the National Homebrew Competition. Two bottles of each of those beers will be featured in the 2011 LongShot Category 23 Variety 6-Pack from Samuel Adams. The other two bottles will be Honey Beer’s Lavendar Wheat beer from Caitlin DeClerq, which won the company Employee Homebrew competition. For more than 10 years, Samuel Adams employees have competed in their own annual homebrew competition. Once all the employee homebrews are submitted (more than 300 this year), Koch and the other brewers at Samuel Adams spend a day tasting the employees’ entries, and they choose three finalists. Those three employee homebrewers attend the Great American Beer Festival and ask attendees to vote for their favorite. This year, GABF attendees chose Caitlin DeClerq’s beer. Roper’s Friar Hop Ale is described as a hybrid of two styles, uniting the big hoppy taste of an IPA with the spicy, fruity flavor of a Belgian. The toasty caramel sweetness from the malt and Belgian candi sugar mimics a Belgian ale, while the big citrus hop notes of an IPA balance the style. A spicy yeast fermentation and hints of orange and coriander round out the brew. Kibzey’s Blackened Hops is a perfect combination of deep roasted malt character and citrusy hop bitterness. Harnessing eight years of homebrewing knowledge, Rodney found that combining debittered dark malts and citrusy hops yielded a surprising and unique flavor for this brew. Its black color hints at roasted malt and coffee flavors, but it is the big hop character really steals the show. Packed with citrusy and piney American hops, this beer has a big flavor and clean bitterness. This is Rodney’s second LongShot American Homebrew Contest win; he won in 2007 with a Weizenbock and his beer was included in the 2008 LongShot Variety Pack. DeClerq has worked as a member of the Samuel Adams sales team since 2006. She created her Honey Bee’s Lavender Wheat with dried lavender petals, giving it a fragrant but soft aroma. A citrus tartness and slight sweetness from the honey and vanilla balance out the finish in this California resident’s brew, perfect to sip while kicking back and relaxing. 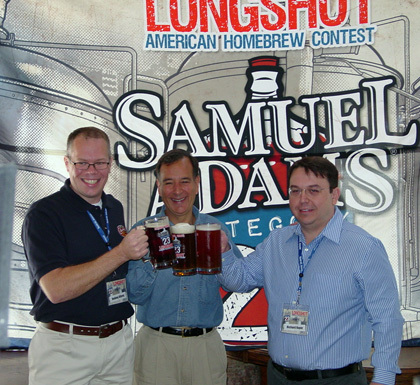 The 2011 Samuel Adams LongShot American Homebrew Contest – Category 23 Variety 6-Pack will be available nationwide in select retail stores beginning March 2011 for a suggested retail price of $9.99.